This was my first ever botanical painting and my first time using water colour paints. It is a painting of the new growth of the Banksia after we pruned it. 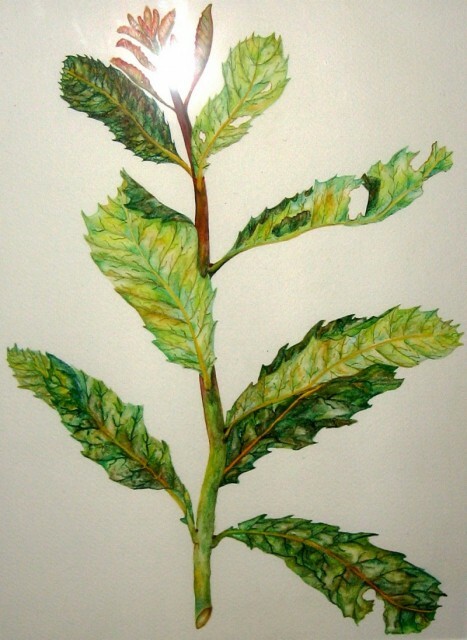 This painting was initially an experiement with painting leaves, which developed into painting the whole branch. As I progressed up the stem my technique changed and I feel the insect eaten leaf on the top right hand side demonstrates the improved technique as compared to the lower leaves.